Printable Business Signs available free below to download for your small business office. 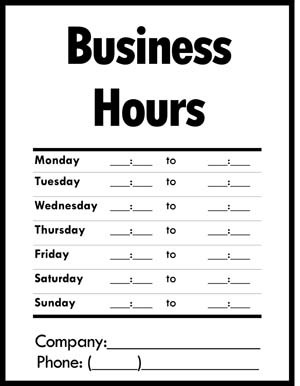 Small printable signs are available here such as a Business Open Sign, Business Closed Sign, Don’t Forget to Turn Off Cell Phone, No Smoking Sign, Hours of Operation Sign, and many more. Proper signage is very important for your small business – simple signs that you can edit and print yourself can help provide direction to employees, customers, etc. in a professional manner. Homemade, hand-printed signs can convey the opposite impression. Using the free templates from this site takes away the learning curve of creating your own signage. Remember, after correctly spelled content, one main point to a memorable small business sign is the strategic use of color. Color can draw attention to business signage or help direct the eye to key sections on the signage. Graphics, such as arrows and outlines, can also help convey messages at a glance. Click here for other free business signs/flyers such as “Testing In Progress”, “Teacher’s Room”, “Car for Sale”, and “Garage Sale” sign. In addition to content and color, it’s important to convey your brand and personality. Choosing the correct font and adding your company logo and slogan are a few ways to do so. You also want your business signs to be large enough to read. The size of the sign and content will depend on where the sign will be displayed. A sign on a bulletin board or wall will need to be in larger font than a sign on a table, where the reader will be sitting. You also want your small business signs to stand out and be noticed when possible. Keeping the content as brief as possible, selecting the right font and colors, adding your logo and using graphics when needed can all help create a professional sign that sets your business apart from others.